Twelve isolates of lactic acid bacteria (LAB) were obtained in the course of a bumble bee gut microbiota study and grouped into four matrix-assisted laser desorption/ionisation time-of-flight mass spectrometry clusters. Comparative 16S rRNA gene sequence analysis revealed that cluster 1 isolates, represented by strain LMG 28288T, are most closely related to Lactobacillus apis (97.0 % sequence similarity to that of L. apis LMG 26964T). Cluster 2 isolates represented by strain LMG 28290T are most closely related to Weissella hellenica (99.6 % sequence similarity to that of W. hellenica LMG 15125T). The single cluster 3 and 4 isolates had identical 16S rRNA gene sequences which were 94.8 % similar to that of Leuconostoc mesenteroides subsp. mesenteroides LMG 6893T, their nearest phylogenetic neighbour. 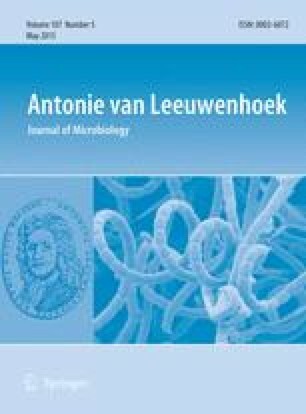 A polyphasic taxonomic study additionally including comparative pheS sequence analysis, DNA–DNA hybridization experiments, DNA G+C content analysis, (GTG)5-PCR fingerprinting and a biochemical characterization, demonstrated that cluster 1 isolates represent a novel Lactobacillus species for which we propose the name Lactobacillus bombicola sp. nov. with LMG 28288T (= DSM 28793T) as the type strain; and that cluster 2 isolates represent a novel Weissella species for which we propose the name Weissella bombi sp. nov. with LMG 28290T (= DSM 28794T) as the type strain. Cluster 3 and 4 isolates, in contrast, represented a very distinct, novel taxon that could be distinguished from members of the genera Leuconostoc and Fructobacillus, its nearest phylogenetic neighbours, by its cellular morphology, non-fructophilic metabolism and DNA G+C content. We therefore classify both isolates into a novel species representing a novel LAB genus for which the name Convivina intestini gen. nov., sp. nov. is proposed with LMG 28291T (= DSM 28795T) as the type strain. The online version of this article (doi: 10.1007/s10482-015-0429-z) contains supplementary material, which is available to authorized users. The authors acknowledge support by Ghent University-Special Research Fund (BOF). The present research involved sampling of bumble bees for which no permission was required as bumble bees are not included in the “Decree of Species (het Soortenbesluit (http://codex.vlaanderen.be/Zoeken/Document.aspx?DID=1018227&param=informatie])” of the Flemish government with inception on 01/09/2009. The authors do not have a conflict of interest.